The partnership between Michael Nuhn (1835-1903) and August F. Strohaecker (1839-1891?) began in 1883. This ad from 1885 specifies that Michael Nuhn had been with the J. L. Jackson Iron Works and that August Strohaecker had an earlier partnership with Adam Happel. The foundry was listed in city directories at 227 E. 6th St. from 1883 to 1902. 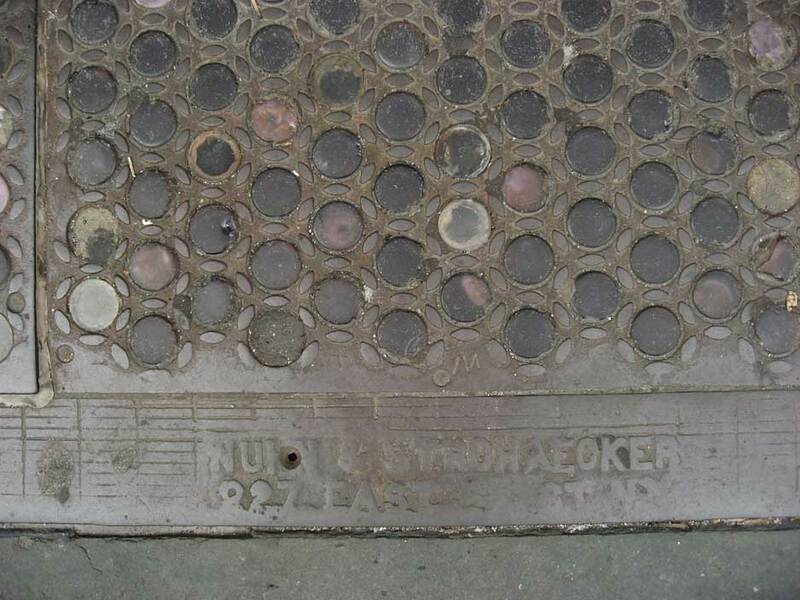 The Minutes and Documents of the Board of Commissioners of the Department of Public Parks for the Year Ending April 30th, 1885, New York City, reported that the firm of Nuhn & Strohaecker had bid $3.33 per linear foot for erecting an iron railing on Fulton avenue, between 169th St. and 170th St., the Bronx. The J. L. Mott Iron Works and Atlantic Iron Works also entered bids. Michael Nuhn's naturalization petition dated 22 Nov. 1861 said that he lived at 541 2nd Ave. The special schedules of the 1890 census enumerating veterans recorded Michael Nuhn's enlistment in the Civil War (private, company G, 6th Regiment, New York). He served from 9 April 1861 to August 1863. In the 1870 U. S. Census he lived at 495 2nd Ave. and his occupation was "machinist." In the 1880 census he lived on Calyer St. in Brooklyn and said that he was born in Hesse-Kassel. In 1900 he lived on East 53rd St., Manhattan, age 65, born Feb. 1835, Germany, immigrated 1858, "Iron Worker." Michael Nuhn's "Design for Rack for Robes" was awarded a patent 12 Dec. 1871 (Design No. 5423). The patent is assigned to James L. Jackson & Brother of New York, N.Y. In April 1864 Friedrich August Strohaecker, born 11 Jan. 1839, Stuttgart, applied for an emigration permit from the state of Baden-Württemberg, Germany. In the U. S. Strohaecker went by the name of either August Strohaecker or August F. Strohaecker. His naturalization petition dated 20 Oct. 1868 said that he lived at 393 2nd Ave. In the 1870 U. S. census he lived at this same address, age 32, machinist. In the 1880 census he lived at 2235 1st Ave., Manhattan, age 41, "works in iron work," born Württemberg. In Sept. 1891 the New York Times reported the name of August F. Strohaecker among those whose wills were scheduled for probate hearings at Surrogate's Court, New York City.